The latest work of the Power pack was announced. The preview in this issue is here. However, I was surprised at the colors. Green of with a yeiiow tint seems to overlay to the whole of the picture. I hope the color return when it is printed. Above is original image. Below is an image of the preview. I have been a long-time fan of your works and I have been following the entries on your Japanese blog for a long time. I just now found your English blog and I'm glad I will be able to post my own comments now! Yay! Finally an English blog! I'm also one of your biggest fans! 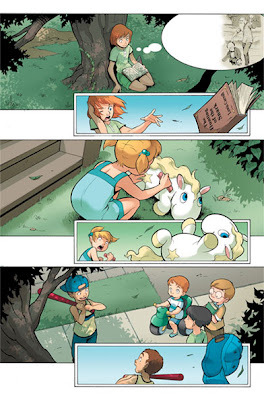 I love what you did in Power Pack and I can't wait for you to do more of them! Awesome work. You guys are definitely an inspiration. I can't wait to see these printed! Yes, It is difficult to match printed media with PC. Please look forward to new issue of Power Pack! Thanks for visits, and thank you for the kind words! I began to make this English blog at the end of last year. I'm a poor English, but foreign peoples visit my blog, so I`m glad that I opened this. I'm happy many ones loves Power Pack! Arigato-. kyubikitsy- Hallo! kyubikitsy. PPDO #1 art by Gurihiru is put on the market in March 26. If found the same problem when seeing my onw colors on the promotions. I think it has to do with kind off cmyk visualization of some programs, that can change the file once saved. For instance when you see an cmyk file with acdsee program, the colors seem too intense and distorted. Hopefuly the final printed page can be darker (another nightmare) but closer to the original file. Great blog, great drawings, keep the good work.